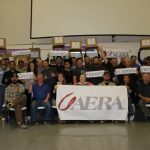 Aera’s employees in San Ardo and Coalinga are competing against each other to help the food banks in their respective communities. The two operating areas have been supportive of their communities previously, but this is the first time they have competed against each other to see which team can provide the most food. In reality, there are no losers in this friendly competition. The competition began July 9 and runs through Aug. 3. In San Ardo, food and other donations will be given to the Food Bank for Monterey County to support residents in San Ardo and King City. In Coalinga, donations will assist the Westside Family Services Preservation Network. Aera’s Feleena Sutton, public affairs specialist in Coalinga, predicted a big win for the team there. “We have each other’s backs in Coalinga,” Sutton said. The need in Fresno County is of particular importance for young families, said Jeannemarie Caris-McManus, executive director and CEO of the Westside Family Preservation Services Network. 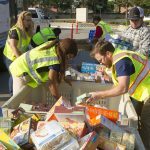 In 2017, San Ardo raised the equivalent of 15,505 pounds of food. 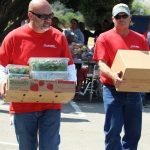 Donations were measured by $1 equaling 5 pounds of food, and in 2018 San Ardo has set their bar high with a goal of donating the equivalent of 16,000 pounds, according to Miller.